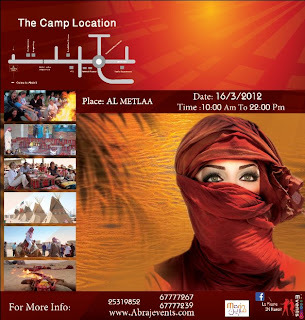 Desert Camp brought to you by Abraj events. The tickets include: Lunch buffet, shisha, morning snack, shows, games/gifts, sports activity, henna, art/face painting for free, live singers (Arabic, English, Latin), souq al madina, Lebanese dabkeh show, DJ, karaoke, cartoon characters, fireplace for roasts, billiard hall, tennis table and much more. Ramy Sabry is scheduled to sing.